haha I love your tree. It is adorable! That is too funny! Even funnier? When I played this video, Iggy started barking! That's hilarious! I actually had to mute the sound while I was editing the video because Igby kept barking. He also barks at himself in the mirror... silly pups. Aww a tiny dog barking at a tiny tree! Cuteness! NO WAY. 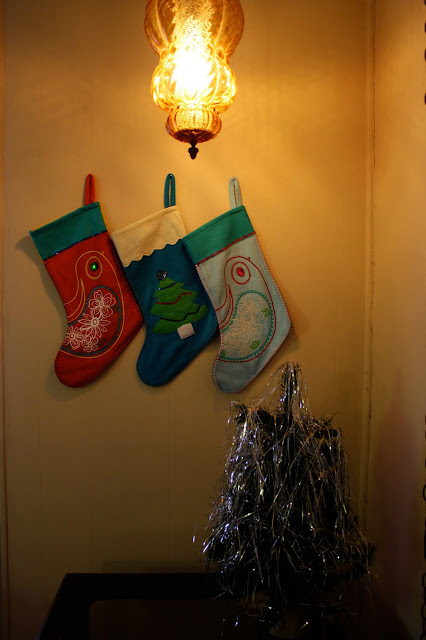 My roomies & I have three stocking from ON hanging up on our mantle. Mine is the blue one with the bird that you have!! I was just going to ask where the stockings were from. Old Navy? Cute! Igby is too cute! Ha! Your dog is so cute! My dogs went nuts at the video, lol. LOL! omg that is amazingly cute! Your tree is the same size as my parents. My mom is all opposed to large trees so she has this little tiny one , I call it pathetic. Cute Christmas tree, and the socks, too! i love the tinsel on the tree! judging by the previous post, it looks like a family tradition? haha my tree is the same size! I bought tiny little ornaments and have a small string of lights going around it. It's good enough for me! I had a tree smaller then that for a few years... but I dont even have a tree this year! So a little tree is better then no tree!